It was with the arrival of the Turks that many would look to the east and see it as a realm ruled by horse archer and horseman. Though such a rule is contested by the dogged presence of infantry and foot archers, mounted archers has remained a dominant presence since the exodus of Indo-European Horsemen from the steppe./n/nWhere the legacy of the Achaemenids is blurred by their presence of Sparabara and Thanvabara footsoldiers, the champion of Eastern Khorasan has long been the mounted warrior; an armored aristocracy whose scepter is the mace and crown the strung bow and spear's tip. Emergent particularly during the climax of the Achaemenids, it would be this noble warrior, these Persian Knights, which would become avatars of resurgent Iran. Yet it would be with the last beats of the Samanid dynasty that Iran would experience sovereign rule, drawn under the yoke of Turkish Dominion as much of the Middle East has come to be./n/nYet if the Persian Phoenix shall not yet emerge, its flames shall still flicker up from the ashes of conquest. 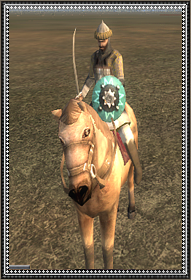 Khurasani Noblemen and their feudal entourages have long stood behind feudal lords of a different Iranian tribe or clan, and in the absence of a proud Perisan to lead them, shall stand beside the new sovereigns of Khurasan. These are not the high lords whose wealth might afford them ornate armor for horse and rider, or the greatest of arnaments, men of whom surely left or lie dead at the hands of the conqueror. Rather, these warriors are of the lower aristocracy, outfitted still in the fine fabrics and sturdy mail, but servicable only as medium cavalry - not the sort to challenge the cataphract champions of the East./n/nThough beholden to a martial pride, it is not for some grand empire or benevolent monarch that these Khurasanis fight for, but the preservation of their fiefdoms and lands. Expecting them to fight as long or as hard as one's own nobility is poor judgement, as Empires of the past have shown the Persian Phoenix lies dormant in every Iranian Noble.